FSM EMBASSY, BEIJING – April 27, 2018. Speaker Wesley W. Simina was in China recently wherehe met with the newly seated leadership of China’s parliament His Excellency Li Zhanshu,Chairman of the National People’s Congress and His Excellency Wang Yang, Chairman of the Chinese People’s Political Consultative Conference. 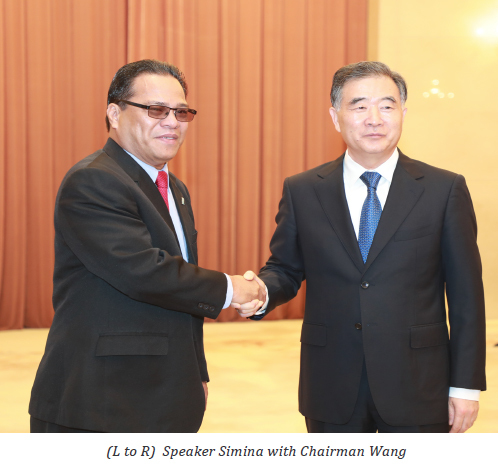 At the invitation of His Excellency Chairman Wang of the (CPPCC), Speaker Simina of the 20th Congress of the Federated States of Micronesia paid an official visit to Beijing and Qingdao in China from April 23 to 27, 2018. The official visit to China has further reinforced the consensus reached between President Peter M. Christian and President Xi Jinping during their meeting in Beijing in March 2017. The Parliamentary Diplomacy from this official visit has reinforced the strong bilateral relationship that exists between the Federated States of Micronesia and the People’s Republic of China. On April 23, 2018, Speaker Simina and his delegation were received at the Great Hall of the People by the newly elected Chairman of the National People’s Congress (NPC), His Excellency Li Zhanshu. During their meeting, consensus between the two legislative leaders was reached to further foster and promote mutual trust between the two sides. Programs such as legislative exchanges will continue, and both sides have agreed to expand cooperation in a broad range of areas to support mutual economic development such as in science and technology, health and education, and tourism, to name a few. The Chairman noted the economic development constraints faced by the FSM and stated that China will support the FSM to the best of its ability. Chairman Li welcomed the FSM’s interest to participate in the Belt and Road Initiative, more specifically, the 21st Century Maritime Silk Road program, and will give active consideration towards the FSM’s interest to be a member of the Asian Infrastructure Investment Bank (AIIB). In the evening at the Westin Hotel, Speaker Simina and his delegation were hosted to a dinner reception arranged by the FSM Embassy. 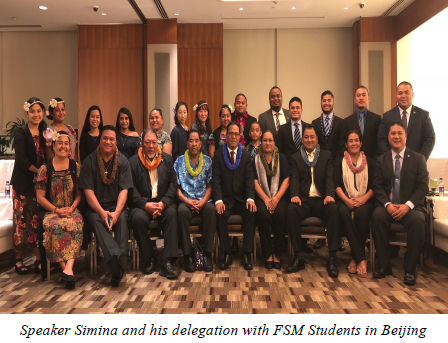 The dinner reception allowed Speaker Simina and members of his delegation to meet with FSM citizens, most of whom are Chinese scholarship students studying in Beijing. Speaker Simina and members of his delegation took turns in providing advice and encouragement to the FSM students studying in China. 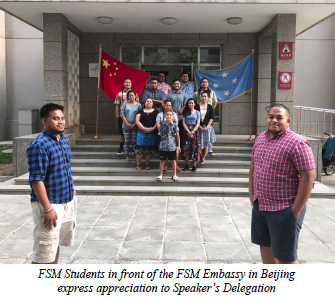 Speaker Simina and his colleagues, who are all members of the Congress Standing Committee on Education, noted the important role that the students play in the overall bilateral relationship between FSM and China and expressed their support towards all the 70 FSM students studying throughout China. The delegation encouraged students to do their best and return home after completion of their studies to contribute positively and meaningfully to development in the FSM. 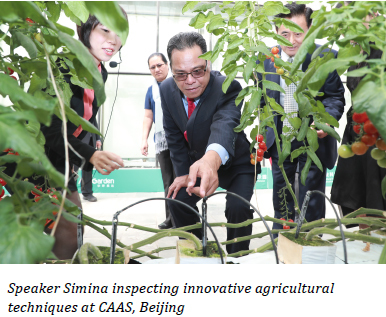 On April 24, 2018, Speaker Simina and his delegation had an inspection tour of the Chinese Academy of Agricultural Sciences (CAAS), and the Yuetan Community Health Service Center. During these two site visits, consensus was reached to explore potential cooperation in the areas of agriculture and health. In the evening of April 24th, Speaker Simina was received by his host, His Excellency Wang Yang, Chairman of the Chinese People’s Political Consultative Conference. Speaker Simina extended greetings on behalf of the people and government of the FSM and extended the FSM’s congratulations to President Xi Jinping and the entire Chinese leadership for their successful elections last month. 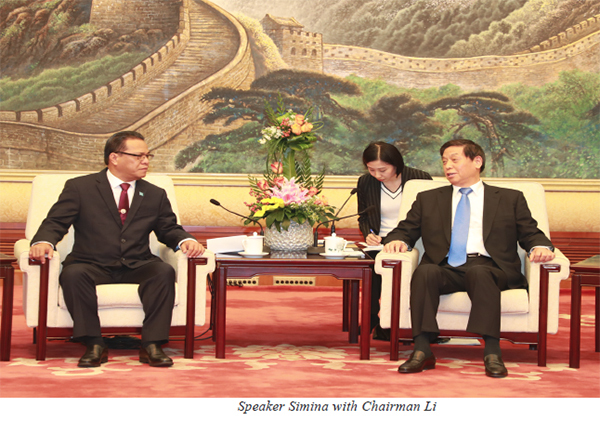 Speaker Simina is the first foreign dignitary to be hosted by the newly elected Chairman of the CPPCC. During their meeting, Speaker Simina expressed his interest to complement and build upon the momentum set by the successful meeting between President Peter M. Christian and President Xi Jinping last year. The Speaker highlighted the FSM-China relations over the past 29 years and expressed his sincere appreciation for the support from China at all levels. Speaker Simina took the opportunity to also thank China for its unwavering position on Climate Change, a dire issue for small island states such as the FSM. In addition to the bilateral, regional, and multilateral forums that China and the FSM cooperate together on, Speaker Simina also suggested that the FSM and China work together through the parliamentarian forums such as the Inter-Parliamentary Union (IPU) to tackle issues of mutual interest. Speaker Simina extended appreciation to Chairman Wang for China’s bilateral and regional support to the FSM. Speaker Simina encouraged continued collaboration with China for the utilization of assistance towards revenue generating projects in tourism, trade, and investments to assist the FSM’s economic and social developmental efforts. In terms of long term commitment towards the FSM-China relations, Speaker Simina has also lent his support towards the construction of a permanent chancery for the FSM in Beijing and sought the support of Chairman Wang for a parcel of land for the FSM when the new diplomatic district in Beijing is ready. The two sides will continue to work together on this long term endeavour. From April 25-27, 2018, Speaker Simina and his delegation visited Qingdao, Shandong Province; the sister-city of Kosrae State. 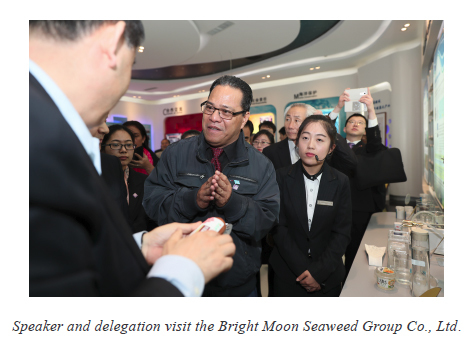 In Qingdao, Speaker Simina inspected the Qingdao Bright Moon Seaweed Group Co, Ltd, a company investing in seaweed and other marine aquaculture products for medicine, food and other uses. The delegation also visited the TGOOD Co., Ltd. to observe the company’s innovative advancements in renewable energy. The two companies that were visited represent a few of the many strengths of Qingdao in the area of marine products and new energy, areas that the FSM is greatly interested in cooperating with Qingdao on. In Qingdao, Speaker Simina was received by Mr. Fu Zhifang, who is the new Chairman of the CPPCC Shandong Provincial Committee. During their meeting, the two agreed to the following three suggestions: 1) both sides agreed to enhance economic cooperation between FSM and Shandong Province, 2) agreed to enhance cultural and education cooperation, and 3) agreed on maritime cooperation such as support for trade in areas of fisheries. The meeting between Speaker Simina and Chairman Fu renewed the relations between the two leaders. 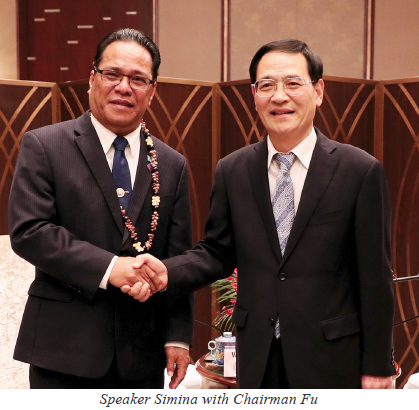 They had first met in Pohnpei last September when Chairman Fu was part of a delegation from the Chinese People’s Political Consultative Conference that visited the FSM. Their meeting this time in Qingdao has highlighted the sister-city relationship that exists between Shandong Province and Kosrae State and will further enhance the relations for mutual benefits. Both leaders noted the close geographic proximity between the FSM and China and have expressed interest for cooperation with Shandong province in the areas of education, trade,and energy. The official visit by Speaker Simina and members of his delegation has further strengthened the political foundation of the FSM-China relationship. The meetings between Speaker Simina and Chairman Li Zhanshu of the NPC, Chairman Wang Yang of the CPPCC and Chairman Fu Zhifang of the CPPCC Shandong Provincial Committee has added greater value to the FSM-China relationship. Consensus was reached for deepened cooperation in various fields such as fisheries, agriculture, health, and tourism, which would further advance the strategic relationship that exists between the FSM and China. It was agreed that high level exchanges between FSM and China will continue. For economic and social development, the Chinese side has informed of the ongoing projects such as the Administrative building in Chuuk, and the Convention Center in Palikir. Projects in the pipeline include the secondary road projects and a passenger cargo vessel. The Chinese side welcomes the FSM to participate in the Belt and Road Initiative and supports the FSM’s membership to the AIIB. A MOU relating to the Belt and Road Initiative is expected to be signed in the near future between FSM and China. This year marks the 29th anniversary of the establishment of diplomatic relations between the FSM and China. The FSM attaches importance to its bilateral relationship with China and supports the One-China Policy. Speaker Simina reaffirmed the FSM’s commitment to the One-China policy and reiterated the continued support of the FSM Congress. Members of Speaker Simina’s delegation included the Speaker’s spouse, Mrs. Ancelly Simina, Chairman of the Committee on Education Senator Joseph J. Urusemal, Chairman of the Health and Social Affairs Committee Senator Ferny S. Perman, Chairman of the Special Committee on Climate Change and Environmental Issues Senator Alik L. Alik, FSM Social Security Administrator Alexander R. Narruhn, and Congress Public Relations, Protocol & Public Information Officer, Mrs. Lynn Narruhn. Supporting staff from the FSM Embassy in Beijing included, Ambassador Carlson D.Apis, Deputy Chief of Mission Vincent K. Sivas, and First Secretary Francis G. Anefal.